The presence of memory effects in perception of interruptedly presented multi-stable images is well established [1, 2]. A recent work that studied different kind of rivalling stimuli (binocular rivalry, kinetic-depth effect and Necker cube) has firmly demonstrated that consecutive dominance phases reported during continuous presentation are neither statistically independent . It is based on a novel concept that defines a cumulative history H for each reported percept persisting for a time interval T in a given session, as the exponential convolution, with time constant τdecay, of the previous perceptual trace. A non-monotonic profile for the H-T correlations for each τdecay is then found, with a significant maximum of 0.2–0.5 at 0.3< τdecay/Tdom <1 (Tdom – average dominance duration). Amazingly, when the respective cumulative histories of both percepts were balanced, transition durations and the likelihood of return (failed) transitions peaked. Such additional influence, coupled with the modest degree of the history dependence for the dominance phases, seems to reveal an essentially noise-driven nature of the perceptual reversals . To clarify this hypothesis we carried out intensive computational simulations of a simple rate model varying the adaptation (A H ) – inhibition (β) strengths variables. Then, we assessed the capacity of the system to simultaneously fulfil the experimental constraint given by the values range observed in 10 subjects studied in . Realistic values for Tdom and its variation coefficient (CV) were imposed as well (see Figure 1). It can be observed that such a simple model can account for the constraints related with Tdom, CV and the history correlation data reported in . Additionally, these data restrict even more the parameter region allowed by the well known Tdom and CV constraints. More importantly, the system should operate in the vicinity of the bifurcation line and inside the bistable regime, which differs from the oscillatory one in that the noise is indispensable for a population to get alternations between the active and inactive states. 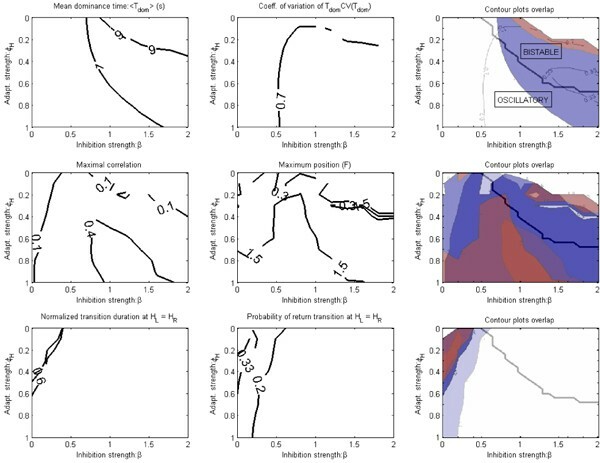 This modelling study supports the hypothesis that a bistable regime would be the adequate mechanism for the noise decorrelates adaptation dynamics from the dominance-suppression cycles, and extends the validity of similar studies to more parametric spaces . Simulation results by varying A H and β parameters. First row: significant regions for Tdom and CV; second row: idem for the maximum of H-T correlations and its position F = τdecay/Tdom; third row: idem for normalized transition duration and probability of a failed transition. Third column shows the overlap of the two preceding figures in the same row, displaying the region holding with both constrains.